Blue Apron‘s stock was up 8.45% in early Tuesday trading after it reporting better-than-expected earnings. It was still trading below its IPO price of $US10 to $US11 per share. Watch Blue Apron’s shares move in real time here. 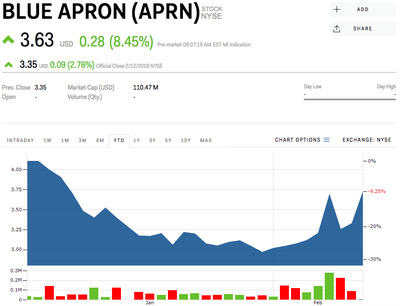 Shares of Blue Apron spiked 8.45% to $US3.63 per share in early Tuesday trading after the meal-kit subscription service reported better-than-expected fourth-quarter earnings. Blue Apron revenue fell 13% versus a year ago to $US187.7 million, but that beat the Wall Street consensus of $US185.1 million. It also reported a quarterly net loss of $US0.20 per share, better than the $US0.27 loss that was expected. 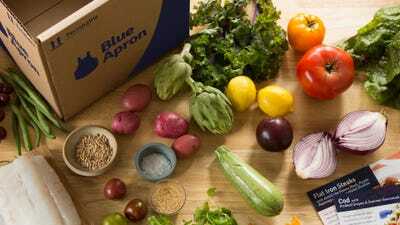 Blue Apron has dealt with several setbacks since it went public last year. The Amazon-Whole Foods merger was announced around the same time it went public, sending shares below their initial public offering price of $US10. In another blow to Blue Apron, Amazon had also filed a trademark application for “prepared food kits” back in July. Blue Apron’s stock was down 9.25% for the year.